Christmas in my memory was a magical time growing up and everything about the holiday was special. My father would order all the groceries at Mr Styne’s shop in Donnybrook and Michael himself would deliver it in his van and stay for a drink or two. Dad bought goodies from far-off places, that we only had at Christmas time, like dusty pink turkish delight scented with rose water and delicious chewy nougat with deep red cherries wrapped in rice paper: dried figs and dates, orange chocolate nestled in gold foil, boxes of Rose’s chocolates, tins of biscuits, and Scottish shortbread. 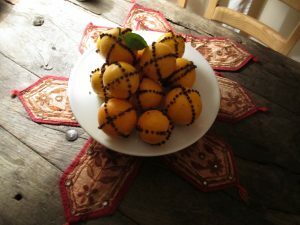 He bought fresh pineapple and a coconut that we would open in the side passage with a hammer and chisel and pomegranates that we called wine apples, my mother’s favorite, inky-black juicy grapes and crates of mandarin oranges. The nutcracker would be put to good use when my uncles and grandparents came over for Christmas, everyone cracking open the hazelnuts, walnuts and huge meaty brazil nuts. For the adults, there were boxes of chocolate liquors shaped like little bottles of booze in pastel colored foil wrappers, boxes of fine cigars, cartons of cigarettes and for the women, pretty cocktail cigarettes in colored papers, pale pink and mint green, baby blue and yellow. It was my job to fill up the cigarette cases on the coffee tables, and fill little cut-glass dishes with mixed salted nuts. It was also my job to empty all the dirty ashtrays when the parties were on. The booze arrived, box after box, and had to be stacked out in the cold side passage: Johnny Walker, Paddy, Jameson, Powers whiskey, Cork Dry gin, Smirnoff Vodka, Hennessy, Remy Martin, Port and Sherry and crates of Guinness, Harp, Carlsberg and Smithwicks beer. It was the best bar in town and the parties were legendary! When I was about sixteen I got a modeling job and my image was imprinted on the Smithwicks beer can sold in the north of Ireland. I did a big commercial for them and was dressed as a magician’s assistant in a sequined leotard, sparkly stockings and high stilettos. I had to place a silk scarf over the magician’s top hat on a table and “voila!” he would produce a can of beer. 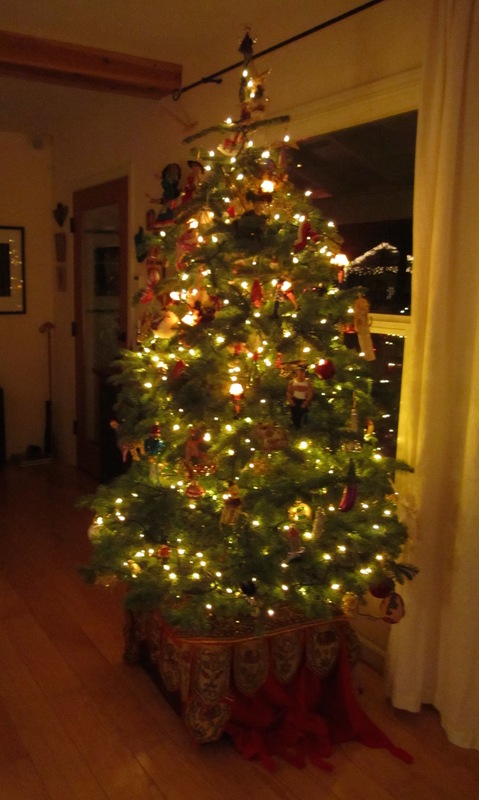 My father was the one who decorated the house and the tree. He hung huge gaudy red tinsel chandeliers over the light fixtures in the center of the living and dining room. 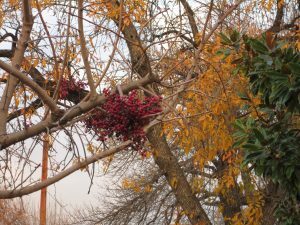 Strings of green and red paper chains were strung along the walls and fresh mistletoe hung above doorways. At that time, the living and dining room were separated by sliding doors and they would remain open for the holiday. Two coal fires burned in the hearth of each room. The smell of the pine Christmas tree filled the house and Aidan and myself were excited about everything. Dad had a lot of patience untangling the fairy lights and checking each bulb for duds. Aidan and I handed him the ornaments and he hung them on the tree. Wish I had the little shiny birds now that were clipped onto the branches. We shouted in glee as we unwrapped the small vintage snow men and Santas and the hand painted glass balls. Ma would come in every now and then from the kitchen to have a look and when the lights were plugged in, Aidan and I would cheer and lie down on the carpet, arms folded behind our heads as we gazed at the tiny colored fairy bulbs. My sisters, I’m sure, have some old photographs of it back in Dublin. But for now, I will post a few of my my own. Wow Lou……I’m near to tears! Hi Aidan, yeh tearing up here too. Do you remember the singin…We thought it was amazing. It was a wonderful time, Ma was was great!!! Wonderful picture of what can only be described as a magical time orchestrated by a devoted dad and his beloved family. Wonderful images! 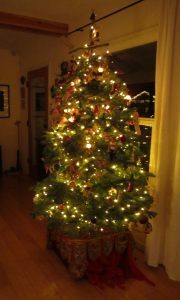 I liked the quiet times alone in the living room with the decorated and expectant Christmas tree at the farm in Wisconsin where me and my five siblings grew up. Lots of magic to go around. Sounds magical indeed Tim growing up on a farm, and I’m sure you guys had snow to frolic in. You take beautiful photographs and I love the old shots of Bill. Merry Christmas to you and your family and cheers to all the good stuff for the New Year ahead.